The counselor that will live in your cabin will be like a big sister or big brother, but they’ll be even more excited to do cool things with you. 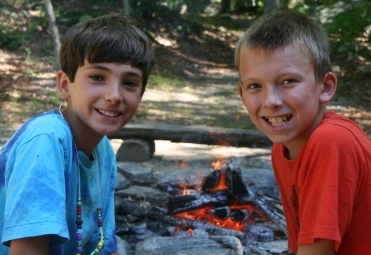 All Wightman counselors have experience either at camp or working with kids. They are hired because they love God and specifically enjoy working with kids. We love our counselors and we think you will too! ​What’s the food like at camp? 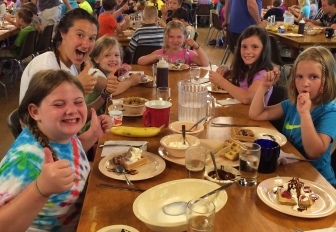 98% of Wightman campers rate our food as Good or Great! We serve "camp”-made food that appeals to kids – pizza, chicken, mac & cheese, pancakes, fresh fruit, and the like. There is variety to our meals and there are always back-up options like a salad bar or PB&J in case you don't like the main course. Oh, and did we mention Taco Tuesday (even if you don't like tacos, which we can't imagine, you'll love the excitement and hype!) or Wednesday Lunch's Chocolate Pudding (Get a BIG spoon!)? At Camp Wightman, we have two “best” parts! One is the time you get to spend learning about God and exploring our theme for the summer – this is the reason we do camp and so we make an extra effort to make these times fun and meaningful for you. The other “best” part is friendship – making friends, being with friends, and having fun with friends. 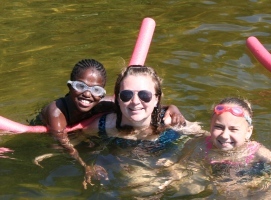 95% of our campers say one of the main reasons they return to camp every summer is to be with camp friends! You will find that camp friendships are slightly different than all the other friends in your life. At Wightman you get to know each other on the inside, not based on what you look like on the outside. Your Wightman friends can last a lifetime. Do most campers come with a friend? Many campers come with a friend, but just as many come on their own. It’s easy to make new friends at camp. Some campers say it’s actually easier to make new friends when you don’t come to camp with a friend from home. If I come to camp with a friend, can I stay in the same cabin with him or her? We want you to be with friends and also make new friends at camp. We make every effort to put you with a friend if requested. You can submit your bunkmate requests on your Let’s Get Acquainted Form – be sure your friend lists you on their form as well and that moms/dads/guardians agree to the requests. Where will I live and how many people live with me? Most campers live in either Spicer or Clark Cabin Village. Each cabin sleeps six to eight campers and one or two adult staff members. Some camper groups may live in a retreat lodge (we have three) which is like sleeping in a big house with lots of bedrooms. All of our cabins and retreat lodges have modern bathrooms with hot water, sinks, and showers. Wightman has a complete health center, with medical personnel who handle day-to-day services and needs. Our health director keeps all medication and distributes it as prescribed by your doctor. Don’t feel well or got hurt? Talk to your counselor and they'll help you figure out the best thing to do.